Hello! Erica on the blog today with my take of our October Mood board. It's full of fun colours and textures but I immediately knew I wanted to use these new Cathrine Pooler inks a friend sent me recently. 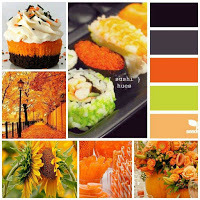 It was like a stroke of fate, the colours my friend sent perfectly matched the mood board! It just had to be done. 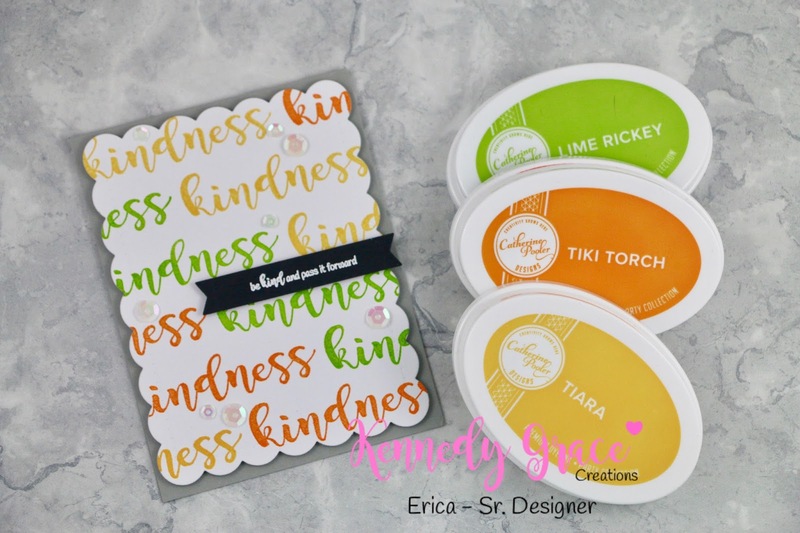 I started my placing the big 'kindess' stamp from Kindness Medley in my MISTI and then I got to work with my inks. These inks are so juicy and stamp incredibly well, I am so impressed! Saying that, I do prefer to use my MISTI whenever I stamp up anything, just in case the lines aren't as solid as I'd like or the colour doesn't cover the image very well. It is definitely one of my absolute must-haves. Anyway, after stamping away for a while I had a nice and bright panel which I used as my background. To incorporate some of the other colours on the mood board I decided to cut out the panel with a scalloped die so it wouldn't cover the whole card base. I used one from Winnie & Walter but you can get a similar one here, then I adhered the panel to a medium grey card base using foam tape. 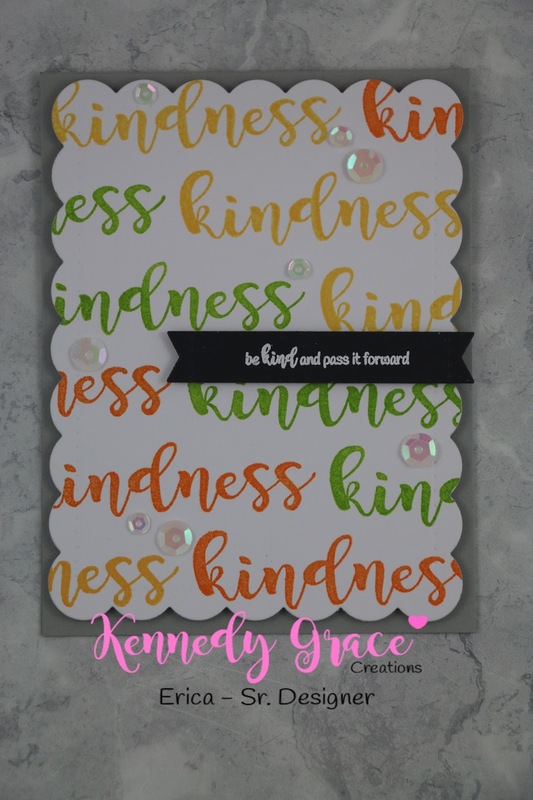 The last colour to include was black so I stamped up one of the sentiments from the stamp set in VersaMark ink and heat embossed it in white. This I also ran through my BigShot with a small banner die from My Favorite Things. The banner I also adhered using foam tape. You can't go wrong with some layers in my opinion! Nor sequins... so I added a few of those too. Or a bunch.. depends on your definition of 'a few'. The ones I used are from the new release called Chantilly Cream and they are lovely and sparkly! I will definitely be using those a lot! With that, I'm all done for today but I'll be back in a couple of weeks with another card and more crafty ramblings. Until then, happy crafting everyone!